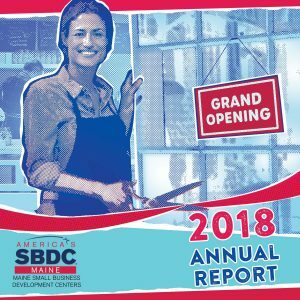 Over 1,500 entrepreneurs and small business owners turned to the Maine SBDC in 2018 to help navigate the process of starting, managing and growing their businesses. With the guidance and expertise of business advisors throughout the state, these entrepreneurs develop the skills necessary to meet their goals, create successful businesses and improve the local economies in which they reside. One can walk down any Main Street in Maine and feel certain that there is a Maine SBDC client, either past or Present, nearby. The program’s impressive results year after year stand as proof of the strength of these advisor-client relationships. Certified business advisors met with over 1,500 clients to help start 136 businesses, create and save 810 jobs and generate $38.7 million in capital. Over 9,500 hours were spent advising clients towards success. Return on investment for the Maine SBDC is evaluated annually through an independent study of the program conducted by Dr. James J. Chrisman at Mississippi State University. His findings are based on information provided by a sampling of clients meeting with a Maine SBDC business advisor for at least five hours. 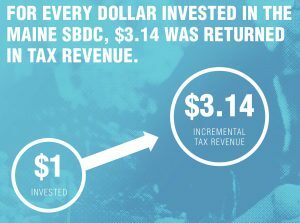 Dr. Chrisman’s most recent report indicated that…FOR EVERY DOLLAR INVESTED IN THE MAINE SBDC, $3.14 WAS RETURNED IN TAX REVENUE. We are committed to Maine’s future by helping businesses and communities succeed. With renewed energy and a fresh strategic direction, Maine SBDC is ready to help guide Maine’s economic future. Maine is our home, and we will be there to support entrepreneurs near and far as they continue to make Maine a welcoming place to live and work. View our entire 2018 Annual Report or DOWNLOAD THE PDF HERE!